In an alley, Splinter is on the run from a trio of guards. He is clubbed from behind and awakens naked in what looks like a dog pound. Suddenly, Splinter awakens for real, it having all been a nightmare. Not certain of the dream’s meaning, Splinter decides to wake his sons for their departure. Boarding a small boat, Splinter, the Turtles and Ninjara bid April, Oyuki, Chu Hsi and Fu Sheng goodbye as they continue their spiritual journey to Tibet. As they disappear, April tells Oyuki to get ready for their flight to America (a thought that gets Oyuki positively psyched). Floating away, Ninjara explains to Raph the significance of the Japanese tradition to tying two offshore stones together to determine whether the following year’s tides will be merciful or violent. Arriving at a rural port in Shanghai, Splinter trades a portion of his samurai armor for a motor boat so that they can traverse the Yangtze River. Then, they trade the boat for camping supplies and hop a train through the eastern hills of Tibet. Arriving in the village of Xigaze, Splinter trades more of his samurai armor for supplies and yaks so that they can scale the mountains to their true destination: The Crystal Palace. Splinter explains that, in his Hamato Yoshi days, his spiritual teacher was the Charlie Llama who dwells within the Crystal Palace (while Ninjara remarks that she’s heard the legends of the palace’s great riches). As they continue their journey the next morning, none of them notice that they are being followed by a four-armed tiger-man. 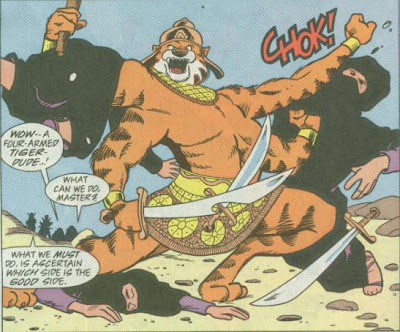 Suddenly, the tiger-man is attacked by four cyclone-spinning assassins called “Whirling Dervishes”. 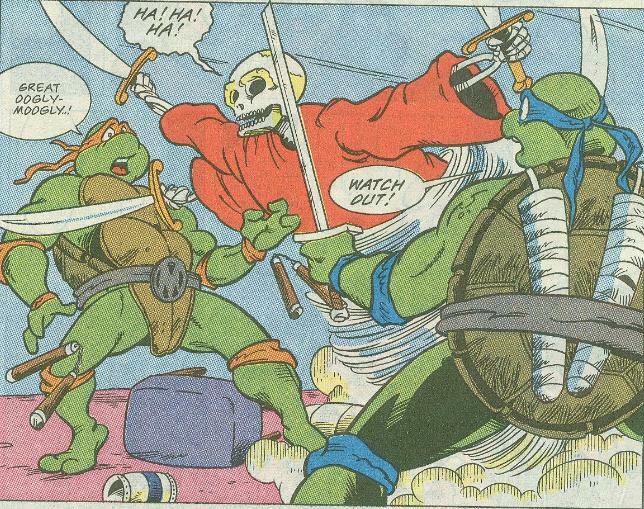 Splinter overhears the fracas and leads his sons and Ninjara to inspect the altercation. 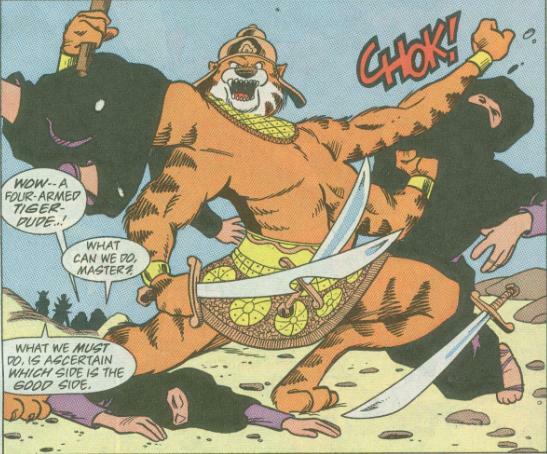 Speaking to the tiger-man in Tibetan, Splinter decides to help him and the Turtles take the Whirling Dervishes out. After the fight is over, the tiger-man introduces himself as Katmandu, a Buddhist making a pilgrimage to the Crystal Palace to seek guidance from the Charlie Llama. The Turtles are completely clueless as to the nature of Buddhism so Katmandu kindly explains the concepts of karma, reincarnation, nirvana and the significance of the Charlie Llama (the reincarnation of Buddha) to them. Mikey remarks that all this talk of nirvana merely “smells like teen spirit”, a joke that makes me feel phenomenally old. Eventually, they all arrive at the Crystal Palace, only to find the place ransacked and the Charlie Llama missing. Suddenly, a cackling skeleton spinning like one of the Whirling Dervishes attacks them with swords and escapes. As the Turtles reflect on what the holy heck just happened, Katmandu remarks that this is all “bad karma”. *This story is continued from TMNT Adventures #32. 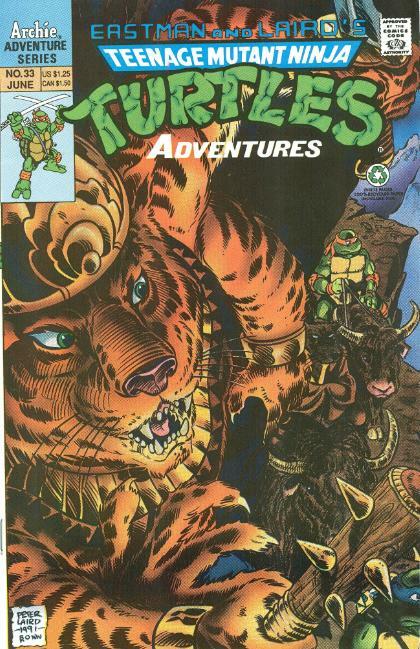 The story continues in TMNT Adventures #34. *April's story continues in TMNT Presents April O'Neil #1. 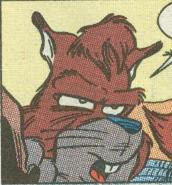 *Splinter's history with the Charlie Llama will be shown in TMNT Adventures #45. *Raph and Ninjara will return to Japan in TMNT Adventures #46. *This issue also included a two-page center-fold map tracking the Turtles’ path through China. *This issue was published in the UK by Fleetway as TMHT Adventures #64. I have to say, I love it when the Turtles do some globetrotting, so long as there’s a logical progression to their path (the Mirage series often dropped them randomly in different countries, usually Japan or China, without any build-up or “journey” to speak of, with them back home the next issue like it never happened at all). This particular story sees them covering quite a bit of ground, and while the trip may have been “dull” in places (spiced up only by some inane “humorous” prattling from Mikey), I prefer seeing them travel through the countryside to reach their destination rather than have them skip from Japan to Tibet in-between issues. Wow. I have to respect Murphy for taking the high road: “We’d also like to add that any truly religious person would be tolerant of other people’s religious beliefs and not equate that which is foreign with that which is evil”. Meanwhile, I can imagine a thirty-something bigot in a Turtle costume marching around Encino, CA with a Fred Phelps-approved “God hates Muslims” sign or something of the like. A sad world we live in. That aside, though the story is actually quite fun, the visuals of the issue are a definite low-point, which I wish I didn’t have to say. I’m not sure if it was artist Chris Allan or inker Rod Ollerenshaw, but something odd is being done with all the Turtles’ faces in this issue. They have very ugly detail lines added to the corners of their mouths, making them look wrinkly. Similar lines are drawn on Ninjara and Splinter and I didn’t care for the additional detail at all. The style doesn’t stick, leaving me to believe that either Allan or Ollerenshaw were “experimenting” and wisely decided not to keep it. Barry Grossman, normally a very competent and skilled colorist, turns in some of his worst work in this issue, mixing up bandana colors repeatedly (two Donatellos in one panel, Raph with a blue bandana, Leo with a purple bandana etc.). Ninjara’s top also changes colors from black to white between pages, Splinter’s muzzle turns white in one panel and whoever heard of white jerky? And that just scratches the surface of all the coloring flubs in this issue. But like I said, Grossman is normally much better than this, particularly when it comes to keeping the bandana colors straight, so I’d like to give him the benefit of the doubt and chalk this issue up to a “rushed deadline” or something. As the start of a new story arc, I found “The Karma of Katmandu” nicely paced and very exciting, even if the art, ink and colors were at a perplexing low. I appreciate Murphy’s drive to teach kids about other cultures and religions, and while some attempts feel shoehorned (the bit about the Japanese tradition of tying rocks together), others actually fit the narrative quite well (the crash course on Buddhism). Reading the letters from bigoted jerks who find any spiritual beliefs outside their own to be the work of Satan is disappointing, but Murphy’s tactful and intelligent responses, as well as his determination to expand the cultural education of the young audience, go a long way in properly fighting that level of ignorance. I always thought that the "world tour" arc of this series was cool, with the educational elements woven very strategically. I'm sure that's a rare time for plenty to see! I'm reminded a moment does show up in one of the 2003 seasons where they go into the future and Splinter ends up without nothing on for half an episode.